A collection of enamelled tidbits on my jewellery bench. I’m enamelling. The kiln has heated up properly by now, and I start unpacking my enamels – little multi-coloured medicine bottles filled with glass powders in rows at the edge of my working surface. For a few moments, I simply hover over the colours, compare the different hues, delight in the subtle differences. Colours govern my life. 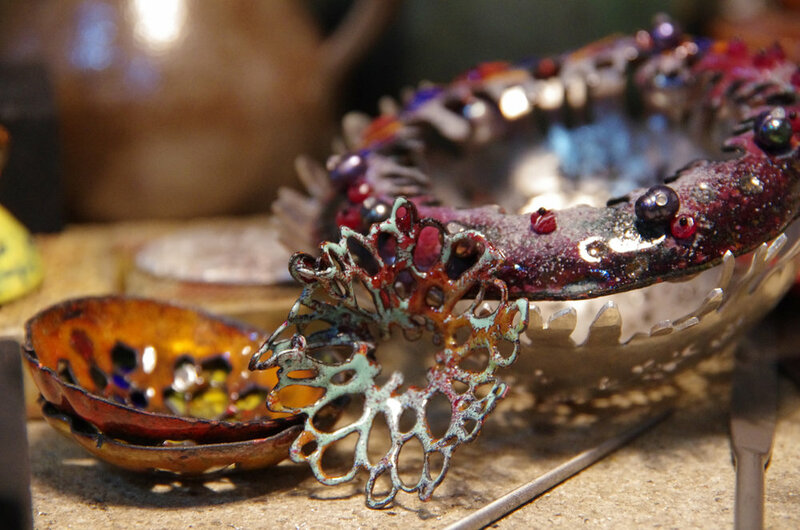 With enamels, each one has a different personality – it is either transparent, so you can see the metal underneath after firing it, or opaque; it can be smooth or grainy, some have a high melting temperature, some a low one, some break up into bits and dissolve into other colours, some get miniature green cracks around the edges when heated a few times. If you don’t treat them according to their personalities, they misbehave: they splinter after firing while cooling down, flake off the metal surface, become cloudy, or burn into an ugly colourless dead-looking surface. 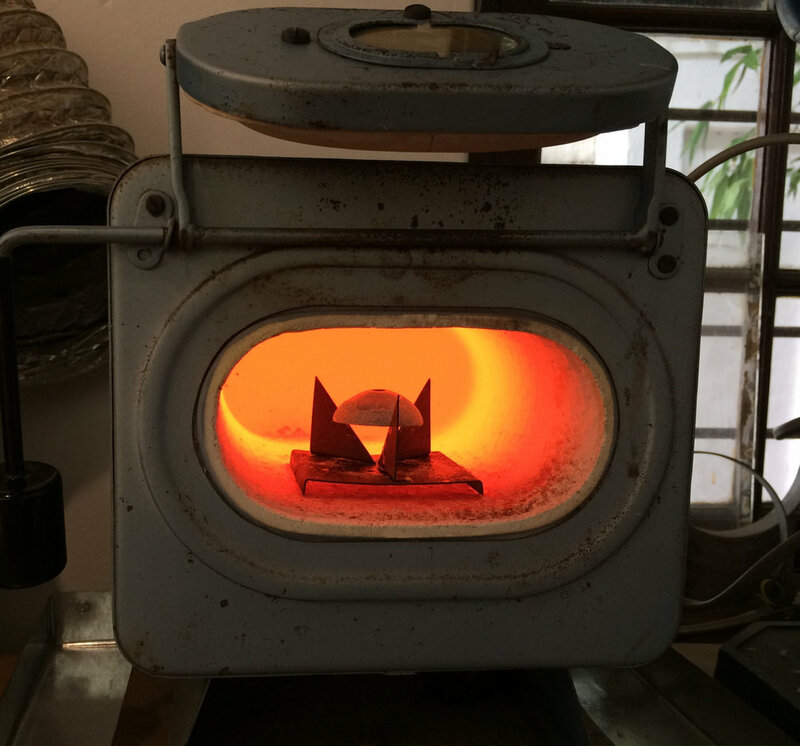 Every action of this process of firing glass onto metal has become a strange ritual. Mixing glue for concave surfaces. Laying out brushes, spatulas, small ceramic bowls. Sifting powders onto metal. The careful, deliberate lifting and placing of the powdered pieces onto metal tripods, rickety with use and coated with stray enamel blobs. And then, opening that furnace of a kiln at 800 degrees Celsius, being bathed in a heat wave that leaves my face tingling and hot. Opening, closing, sifting, waiting, cleaning off firescale, sifting. Balancing, opening, closing, waiting, sifting, opening closing. It’s like a dance and I become entranced in it. After some time, my face becomes glowing hot and it must be bright scarlet by now. I forget about my surroundings, surrender myself willingly to the power of the enamels. Then, and only then, can they unfold their true beauty – the moment I stop trying to master them, and let them lead me. They fuse, run, melt, burn, shimmer into spectacular patterns that no-one could have foreseen. And I am left deeply satisfied by the thought that this individual pattern that just happened, right there, can never ever be reproduced again. If this is not magic, I wonder what is. To me, enamelling really isn’t a science, even though it’s a scientific process. First layer done - one of many. It’s no surprise that enamelling has become my favourite jewellery-making technique, considering the significance of colour in my life. Colours have their own designated meaning in my world, every cypher and every letter has its own colour in my mind, large numbers become colour sequences. However, my fascination with enamels lies deeper than just its appearance. The ancient history of the enamelling process, almost alchemical in nature before the advent of electricity, intrigues me just as much. Jewellers have used enamel for its intrinsic qualities of brightness, hardness and durability, also taking advantage of its elusiveness and mutability to suggest, among other things, precious stones, filigree inlay work, stained glass and even painting. Although it is unclear how long enamels have existed, it is likely that they were developed in Egypt. Masters of working with fire, the Egyptians invented glass. Around the third millennium BCE they perfected the fabrication of the earliest known synthetic pigment, a double silicate of copper and calcium that compensated for the lack of affordable natural blue pigments. This new blue pigment, called Alexandrian blue, could be used in paints, inks, glass and, mixed with sodic alkaline salts, form a variety of spectacular blue faience glazes. The development of early enamelling techniques is documented by two major sources: the Benedictine monk Theophilus whose 12th century treatise on Medieval art techniques explained some of the contemporary enamelling processes, as well as the notorious 16th century Italian jeweller Benvenuto Cellini, whose Trattato dell’Oreficeria includes detailed, step-by-step instructions on enamelling. Cellini describes the preparation of enamels as a laborious process of hand-grinding chunks of coloured, transparent glass and then washing the powder with filtered water to remove dust and impurities. Both authors describe the same kind of furnace – a type of upside-down earthenware vessel inside a protective perforated iron container, placed into a roaring fire and completely covered with hot coals. This challenging and time-consuming process can only be marvelled at, since each enamelled piece required numerous firings and timing thereof had to be impeccable. Since enamelling was depended on pigments for its vivid colours, it is also clearly linked to alchemical practices. Much of the medieval research in chemistry was carried out by alchemists, whose laboratories and methods were described in an arcane language, often laden with metaphor. Their reluctantly and cryptically published discoveries show a wealth of experimentation focused on the transmutation of substances. Because of this interest in the mutable properties of metals, as well as their work with processes of extraction and distillation of solids and liquids, alchemists stimulated a renaissance in the production of colour pigments: they created vermilion red from sulphur and mercury, yellow by adding sulphur to arsenic, and a gold pigment by mixing sulphur, tin and mercury. Cloisonné enamel: little pockets of colour, framed by silver or gold borders. These are cuff links I made in enamel and white gold. 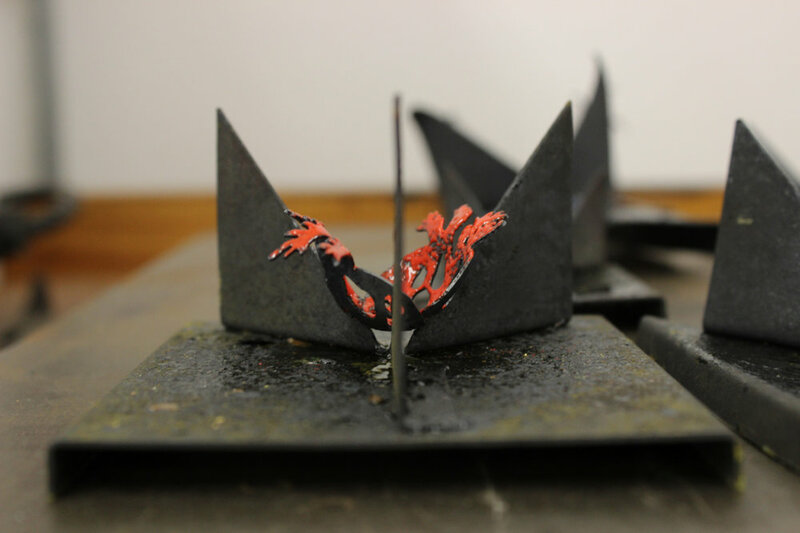 Apart from this obvious, historical link, enamelling also evokes the language of alchemy: born from fire, the pale powders transform into brilliant, vitreous colour; the process is technical yet also deeply intuitive, experimental and somehow mysterious. The exact moment of perfect, glossy fusion relies on timing – in my case never governed by a neat and orderly time scale, but rather an enigmatic internal clock that relies on ‘gut feeling’ to gauge when a piece is ready. This gloriously ‘messy’, spontaneous side of the enamelling process subverts the scientific, grid-like standards that are superimposed on almost every part of modern routine. Pale powders transform into bright, glossy glazes. Delamare, F & Guineau, B. 2006. Colour – Making and Using Dyes and Pigments.London: Thames & Hudson. Strosahl, J. P. 1981. A Manual of Cloisonné & Champlevé Enamelling. New York: Charles Scribner’s Sons. Photographs: Nicola Fouché and Nora Kovats. Sifting pink enamel powder onto a copper earring segment.